This article is about an episode of The Super Mario Bros. Super Show!. For the Nintendo Switch game of a similar name, see Super Mario Odyssey. "9001: A Mario Odyssey" is the twenty-seventh live-action segment of The Super Mario Bros. Super Show!. Its corresponding animated episode is "On Her Majesty's Sewer Service". The episode's name is based on the novel 2001: A Space Odyssey and the 1968 film of the same name. 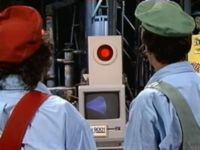 A programmer named Einstein is at Mario Brothers Plumbing, typing away into a special computer/pizza machine labeled HAL 9001. Luigi asks if Einstein's ever going to be finished, just as Einstein announces that the computer is ready. The computer starts to talk, introducing itself as the HAL 9001 computer and pizza machine. Einstein asks how HAL is doing, and the computer assures him that nothing is wrong with his programming. Einstein then introduces HAL to Mario and Luigi, but Luigi doesn't like the idea of talking to a machine. HAL tells Luigi that he doesn’t need to worry. When Mario asks Einstein about the pizzas, Einstein gives his order to HAL: A pepperoni pizza with no anchovies or fried eggs. Einstein tells Mario that you need to say no anchovies or fried eggs or HAL will put them on the pizza. Almost instantly, HAL prepares a pepperoni pizza for Mario. Einstein explains that HAL never makes mistakes, leaving Mario and Luigi alone with the computer, and tells them to call if they have any questions. Luigi then places an order for a sausage pizza with no anchovies or fried eggs. Later on, Mario and Luigi order crazy pizzas like a hamburger pizza (with actual hamburgers), and a bologna pizza. However, instead of a bologna pizza, HAL prepares a golf pencil pizza, which confuses the brothers. HAL then follows up with a nurse shoe pizza, even though an order wasn't even placed, and assures Mario and Luigi that nothing is wrong with him. Luigi asks HAL to just a bologna pizza, and is given a dog biscuit pizza instead. After a popcorn pizza is made, Luigi opts to simply pull HAL's plug. But HAL says he won’t allow that. Instead, HAL tells Mario and Luigi to gaze into his eye, and succeeds in putting them in a trance. While they're under his spell, HAL orders Mario and Luigi to eat all of the ridiculous pizzas he made. At that point, Einstein returns, as he forgot to give Mario and Luigi his bill. When Einstein sees what HAL’s done, he frantically unplugs all of the computer’s cords, and after a while, succeeds in terminating the system. With HAL offline, Mario and Luigi come to their senses, and Einstein apologizes for everything, saying that they would've had to eat HAL’s horrible pizzas. Mario then questions: "What horrible pizzas? ", and starts eating the popcorn pizza. This was one of the 12 live-action segments that were absent on Shout! Factory's DVDs due to legal issues. This page was last edited on December 13, 2018, at 18:22.